I had never been through anything more painful and more beautiful. I believe that love, in all its forms, is at the heart of life. It is the root of everything. It is the reason it feel so good to hold our new baby granddaughter, or hear the emotion in our partner’s voice when they speak their wedding vows, or to see our son receive his diploma. It is also the reason why it hurts so much when we lose someone – whether it’s someone we had a wonderful relationship with, or a challenging one. It’s all a testament to the love we have within us, and there is so much beauty there – alongside the pain – more often than we realize. The experiences I had after I lost my sister, directly led to where I am today, and the work I do in this world. I help people to recognize and express the value and beauty within themselves and their experiences, so that they feel loved, heard, seen and inspired. With active listening, transformative writing, and heart-felt ceremonies, I enable and empower people to validate and express their love during the most profound changes of their lives. I will never forget the final moments of my sister’s Celebration of Life. Sun was streaming in the windows and three friends of mine who play Irish traditional music sat among the guests near the front. The fiddler began to play a reel, very slowly. Gradually the accordion player joined in and the tune’s pace increased… and then finally the guitar was added as the reel became the perfect tempo for dancing. Sadness into Joy – both emotions together in that incredible progression of music were the perfect send-off for my beloved sister. It didn’t change how much it hurt to lose her. My words of love for her and the music, the participation of her friends, her cherished daisies and the other details of that very personal ceremony – what they did was empower me to find the beauty within that pain – and to feel and hear and see the love I had for her (and the love she had for me) in a powerful way that helped sustain me. Whether you are celebrating the one you want to spend the rest of your life with, or honouring someone you will miss for the rest of your life, I am here to help you share and express your love in this world and to feel, hear, see and know just how loved you are. I’m Laura Higgins and I’m a Celebration of Love and Life expert. 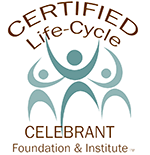 A graduate of the prestigious Celebrant Institute & Foundation, I am a ceremony specialist trained in the personalized use of effective structure, ritual, symbolism, storytelling, choreography and other elements. As an ordained metaphysical minister ordained through the Bancroft Centre for Awakening Spiritual Growth, among the many ways that I serve my community are: I am licenced by the government of Ontario to perform weddings, I offer support to families who have worked with me regarding the loss of a loved one, and I hold Inspired Life Gatherings in Newmarket and online. I also offer workshops to help people honour and cope with their grief through personal ceremony. My training as a life coach also enhances the support I offer to my clients and my community. I honour each individual’s beliefs and values and their unique path and I believe that love is love.